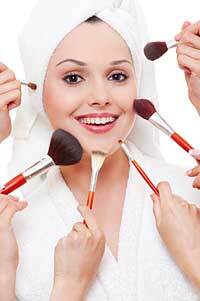 Cosmetology covers a wide range of disciplines; that’s its attraction for many people. A career in cosmetology is a great way to express individual creativity while still helping others. While requirements for a cosmetology license do vary slightly from state to state, almost all require a set number of hours of classroom training from an accredited cosmetology school. The right school can make all the difference in getting off to a solid start – and you can even start with high school cosmetology programs. It helps a lot for students to get a feel for what cosmetology school will ask of them — including how long it is and what it costs — and what it takes to get that career going. That’s what our cosmetology pages are all about. Working as a nail technician offers the opportunity for both helping clients and being wildly creative. This is because they are trained to recognize health problems related to the nail as well as embellishments and manicure techniques that make their clients look fantastic. Nail techs can choose to specialize in one end of the spectrum or they can make each day a mix of the therapeutic and the purely aesthetic. Online nail technician schools and brick and mortar colleges make sure that those who want to become nail technicians do so with all of the information and skill development and equipment possible to ensure that they are the best at what they do. Applying makeup is truly an art form. Makeup artists may work on movie and television sets applying futuristic or horror makeups, or they might visit clients’ homes and apply makeup for special events. Some might even do a mix of projects, jetting off to exotic locales when it fits their schedule and working in a salon when they want to be closer to home. Regardless, there is a certain level of skill involved, and it can be learned at the right makeup school. Students who want to become makeup artists should make sure that they understand what requirements must be met in order to achieve their goals. Once licensed, the sky is truly the limit for a talented makeup artist. Estheticians make sure that their clients look great from the skin up. They deal with all of the aspects of skin care, including hair removal, dermabrasion techniques, and even makeup application. These experts in all things skin are highly sought after by their clients, particularly when they have a proven track record of excellent skills. Choosing the right school is an important part of an esthetician gaining the right pedigree to succeed in her chosen field. Once licensed, there are still plenty of things to learn and to keep up with in order to stay at the top of the field. Did you know online esthetician schools are becoming more and more mainstream? They can reduce the cost of your esthetics education and the number of hours you will need to be in school. The traditional corner barber is still alive and well, contrary to what many people believe and there are many good reasons to become one. Those who want to become a barber should know that the profession involves more than just taking a set of trimmers to a head of hair. Barbers train in the care of both long and short hair, as well as the different manners of cutting and trimming all lengths of hair. Unlike cosmetologists, barbers are also trained in the skills of properly shaving their customers during their time in barber school. Occasionally considered to be the male version of a cosmetologist, barbers are proving that they have specialized training and tools to meet all their clients’ needs. Massage therapists are not usually considered beauty professionals but they can be employed in that manner. It is common for estheticians, for instance, to give facial massages and it is more and more part of a barber’s job to give a quick shoulder massage to clients. Though formal massage school is not necessary for non-therapeutic massage it is a requirement in many areas if you wish to be a licensed massage therapist. For most people, finding a school nearby is one of the most important factors in the decision making process. Who wants to travel half way across the country to go to school in a strange place? There are many things to deal with when you move to a new location; things that can distract you from your studies and make your training more difficult than it needs to be. Our World is Beauty makes the searching for a nearby college easy. We have provided a school finding app on many of our pages so that all you need to do is enter your ZIP code and a few other details to get information on training centers close by. For those with a passion for them beauty careers are a supremely fulfilling way to make a living and help others. Everyone likes to look good. And everyone likes a little pampering and to be taken care of. If you feel like you are a people person and like the creativity and technical knowledge involved in this line of work then you are a great candidate for training and working in this field. Our site is directed toward you getting started in your career by assisting you in finding an institute that’s right for YOU!